Writer and publicist Tigran Paskevichyan has presented to the media his new film telling about the political upheaval of recent years that ended in mass street protests and their subsequent violent suppression. Paskevichyan, who is known for his pro-opposition views, is the author of the scenario for this 124-minute-long film entitled “The Lost Spring of Armenia”. The writer believes a full disclosure of the circumstances of the March 1-2, 2008 violence that followed a disputed presidential election is the most urgent and vital issue for Armenia today. The clashes between opposition supporters and security personnel on the first day of spring in 2008 resulted in ten deaths, including two among law-enforcement. The violence erupted after ten-day street protests against the official outcome of the vote giving victory to current president Serzh Sargsyan. Paskevichyan’s film consists of two parts. The first part tells about the events happening in Armenia from September 2007 till March 1, 2008 – a period that marked the political comeback of independent Armenia’s first president Levon Ter-Petrosyan, who joined the presidential race on a platform strongly critical of the incumbent authorities and their favored candidate. The uneasy campaign pitting Ter-Petrosyan against then Prime Minister Sargsyan culminated in the February 19, 2008 vote that was followed by mass demonstrations of Ter-Petrosyan supporters against what they viewed as a rigged ballot. 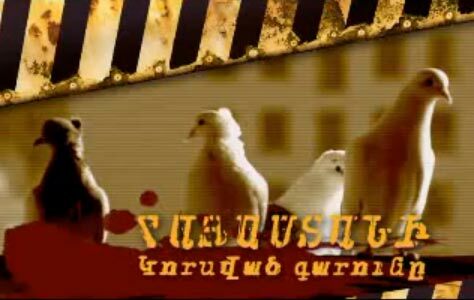 The second part of the film presents the clashes that took place in central Yerevan on March 1-2, 2008 and the subsequent government crackdown on the opposition. Paskevichyan says the work on the film (directed by Ara Shirinyan) lasted for 16 months. The author provides a step-by-step description of the causes that led to the dramatic events three years ago. From Paskevichyan’s perspective, the 2008 presidential election was a formal event to install then Prime Minister Sargsyan as Armenia’s next president, but with his political comeback Ter-Petrosyan managed to mount some serious challenge to the incumbents, ruining their ill-hatched plans based on the assumption that the country’s nearly defunct opposition was unable to resist them. (Law-enforcement in Armenia has so far failed to identify anyone directly responsible for the killings. Earlier this month President Serzh Sargsyan essentially ordered a fresh probe when he told his top security officials he expected “a new impetus” in the investigation of the ‘March 1’-related cases. The move came shortly after Ter-Petrosyan listed several demands of the opposition, including a comprehensive investigation of the post-election clashes, setting an April 28 deadline and threatening “a final rupture of relations between the authorities and society" unless the demands were met by then). At the presentation of his documentary on Tuesday, Paskevichyan announced that it will be sent to Armenia’s current leadership, and also to former president Robert Kocharyan, former minister of foreign affairs Vartan Oskanian and all those who were related to the March 1 events. Meanwhile, the “March 1” nongovernmental organization set up by the families of the victims of the clashes intends to ask Yerevan’s Moscow Cinema House to allow showing the film in one of its halls, as well as offer all TV companies in Yerevan to show the film on their channels in return for a payment. “My view is my view. It will be clear in the course of time how far it is acceptable to the viewer and the public,” said Paskevichyan, adding that he will certainly attend the ANC’s April 28 rally. “All our problems will be solved when citizens of Armenia are able to express their will through elections, assemblies and media. This is only a derivative of the fact that ‘March 1’ remains undisclosed,” the publicist concluded.